What used to be Cap's flagship title has basically been taken over by Bucky for the last few issues. We have gotten a reimagined origin, where Bucky was trained (mind you, as a kid younger than Cap) to be the dirty arm of Cap, doing the dark missions and such. Ninja, please! 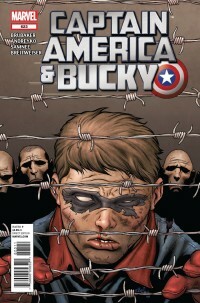 We also got to see some of Bucky and Cap's adventures in WWII. This is where I like my Bucky, back in WWII, getting ready to die in that famous explosion. But of course, Brubaker brought him back....ugh. Anway, this issue is very interesting, because it shows Bucky going solo with the original Human Torch's ally, Toro. They get some info about a spy being captured by the Nazis and decide to rescue him. What they find changes Bucky forever. Bucky goes after the spy with his usual bravado and lack of full understanding. What he finds is a Nazi concentration camp, where he gets a first hand look at the Holocaust. Samnee and Breitweiser bring the horror of this scene to vivid portrayal as Bucky sees the furnaces and the emaciated living and dead. He naturally goes off on a course of righteous anger, asking guards he pummels, "Why? How did you allow this to happen?" Many of us still ask that today. The art is stark and striking. Bucky and Toro escape the camp with the spy, but have to leave many prisoners behind. Bucky wanted to go back to liberate it, but would not get the chance....as Cap and the Invaders return and Bucky joins them on more missions. He and Cap would both be lost before they had a chance to go back and liberate that camp.....and Bucky would become something just as horrible as the Nazis....a Soviet Assassin.....which is where what should be now called the Bucky Chronicles will pick up next issue. OK, I get that we are trying to flesh out Bucky's background more, since now we know he has cheated death twice (THANKS FOR NOTHING, NICK FURY!!!) and appears poised to be a new major character. However, if the book is Captain America, we really should have more Cap than just a couple of pages. I'm just saying. However, the story and the excellent colors by the beautiful and talented Bettie Breitweiser do a little to make up for the lack of Cap. Brubaker can tell Bucky's story, just keep it in the past. Brubaker uses excellent first person narrative to show us Bucky's emotions and reactions on his adventures. I would say pick up Cap's solo series, but maybe give this one another couple chances before you decide if you want to take it off of your pull list.